While the primary purpose of a retaining wall in landscaping is to hold back earth, it can also be a major design element of your yard. Any number of retaining wall design options may be just what your landscape needs. For instance, given the hilly topography of the Atlanta area, a stone retaining wall that cuts into a slope frees up space that may have been previously unsuitable for a patio or walkway. Or a series of low terraces can be used to create a level playing or entertaining area in a once-sloped backyard. 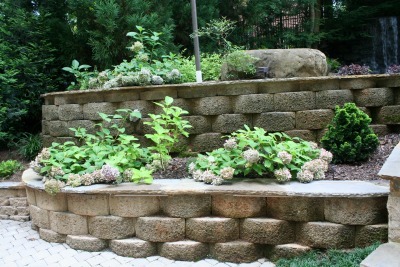 As a major focal point in the landscape, a retaining wall should be attractive and suit the setting. Keep in mind that the overall size of the completed wall will affect the impact of its presence. A series of low terraces will work in much the same way as one massive retaining wall to tame a slope but will look completely different. A wide range of stone works well for retaining walls, from hefty boulders holding back a hillside to distinctive stone veneer mortared to reliable concrete block. If you’re interested in the look of stone but not its price, consider the options available with stone-look interlocking concrete blocks. Retaining walls also can be constructed out of wood. Wood does not offer the longevity that stone does, but its unique texture is appealing to some homeowners. Never underestimate the engineering required to build a retaining wall. The lay of the lands and soil type have heavy bearing on a wall and must be considered. Building a low retaining wall to form a raised planting bed at the foot of a gentle slope is much different than building a 4-foot-wall to hold back the cut left after excavating a driveway through a steep hill. You’ll need professional services of someone like the landscaping professionals at Hutcheson Horticultural can provide, as well as a building permit, to build a retaining wall higher than 3 feet. If adding a retaining wall is something that you would like to add to the landscaping of your Atlanta home, contact Hutcheson Horticultural at 770-924-1001 or use the “Contact Us” feature on our website.